Underpinning this view is the fact that culture and place have, for most of human history, been inextricably linked. Traditionally, culture is dependent upon place. As people chose places to inhabit, their cultures grew directly from the natural assets of the places they settled. The ecology of those places, the foods they offered, the materials they provided for making shelter and clothing – all these place-attributes became converted, through human use, into cultural characteristics. As people transcend life’s practical requirements cultures grow in complexity. The traditions that enrich a culture derive from its place; art reflects and interprets place, mythology and story build around it. The expression of art, the stories that connect people to the land that sustains them, and the manifestations of spiritual imagination create cultural meaning. That meaning provides individuals with identity and offers them a sense of belonging that is integral to and inseparable from their culture. Cultures that sustain themselves over long periods of time find a state of balance with the ecologies of their places. Human activity inevitably alters ecologies, but by no means guarantees their destruction; ecosystems can be altered in ways that enable them to thrive in symbiosis with the culture that impacts upon them. This provides a real model of sustainability and one that most Australians, inhabiting a land managed and sustained by peoples for tens of thousands of years should readily identify with. The modern era has profoundly altered the place/culture nexus. Cultures most invested in the industrial revolution have experienced a progressive erosion of their links with place over two to three centuries. Global supply chains of increasing complexity and ease of movement across the world have diminished connections between cultures and their places of origin. In the post-industrial era this is exacerbated by digital technology that facilitates connection to an infinite number of others, none of whom need necessarily share our physical space. Conversely, cultures that have remained most closely connected to their lands best understand the centrality of place in their lives, knowing the myriad ways in which it provides for every aspect of their existence. Australian aboriginal peoples show us ways in which their cultures have evolved in interdependent relationships with place, often called country, and are profoundly weakened when those relationships are damaged. And damaged they are. The contest for country, or place, is at the heart of modern Australian history. Few can fail to feel its tensions, and it remains our collective work to grow as a national community in ways that help to ease them. Current generations cannot right every historic wrong nor are cultural miscalculations consigned to the past. The idea that we can achieve closure on the enduring effects of Australia’s historic contest for country is no more than a comforting myth, as is the case for all griefs. The same might be said for reconciliation, a word rendered meaningless by its political abuse. The best we can hope for, while seeking a new cultural cohesion between all who co-exist here, is to learn to live with the damages of our awkward history, both received and inflicted. As a society we are doing this work of seeking cultural accord within an evolving context, in which numerous previously distinct, place-based cultures merge with one another as people move across the world, settling far from their places of cultural origin and adapting to their new host cultures. The resulting evolutionary cultural synthesis; as we encounter one another, acclimatise to new places, absorb different cultural practices, and grapple with emerging digital opportunities might be thought of as a great contextual cloud, enveloping all our lives. Within this cloud we can find ourselves blundering around; searching for the meaning, identity and sense of belonging that may have more readily attached to our ancestors in simpler times. It in this context that placemaking, specifically cultural placemaking, becomes vital. That the word placemaking has rapidly become ubiquitous is mostly a good thing. Its embrace as a foundational concept in urban development is indicative of an industry taking responsibility for its sizable role in shaping the world. The development industry is acknowledging its impact on people’s lives, communities and cultures. As a human-centric activity, placemaking is bringing the interests of people - cultural interests - to the fore. This couldn’t be timelier. The cultural miscalculations underpinning the contest for place between Australia’s First Nations peoples and those that came later have echoed through the decades since European settlement as migrants from many other cultures have sought to find their place here. In this sense of people seeking a new home, place isn’t just physical, it’s also representative of the desire to be accepted, to become part of something, to belong, to find one’s place. It’s metaphysical. In serving this end, contemporary placemaking can be seen as an integrative practice, creating imaginative and accessible environments that offer innumerable points of cultural stickiness. They might embody qualities that appeal to our common humanity, regardless of our cultures of origin and they might embody qualities that reflect or augment a particular culture for the benefit of all. Almost without fail, they will be interventions that express humanity in a sensual way; creating an interface of cultural software between the hardware of the built environment and the people who experience it. In responding to the metaphysical meaning of place, placemaking’s integrative possibilities generate opportunities to create environments, in collaborative efforts with those who will experience them, where all feel welcome. Then, at its best, the practice of placemaking can transcend even its integrative role, becoming a generator of equity in the public domain, and perhaps uniquely, a culturally healing profession. 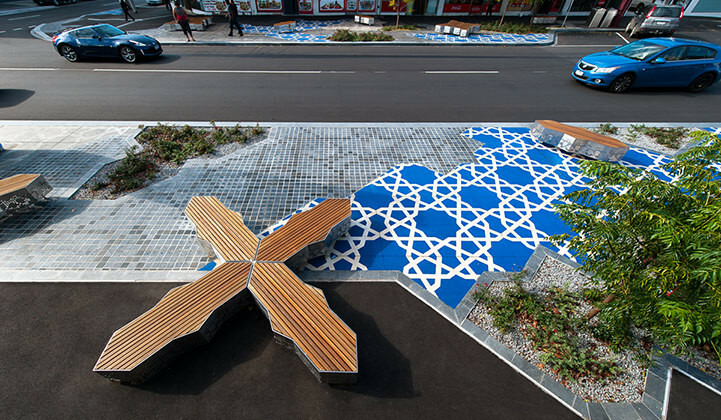 Placemaking as a practice, particularly cultural placemaking, will continue to evolve. Cultural placemaking is not only about the integration of visible expressions of art, but also the things that, by appealing to our shared humanity, help connect us all. Places that create opportunities to interact with others by offering us things to do together, as well as places that allow for the quiet and solitary indulgence of our inner selves. Places offering the variation that surprises and show the marks of their makers. Layered, textured places we experience as cultural ecologies, that, like good works of art, reveal their depth through repeated exposures over time. Good cultural placemaking is much more than contributing art to a project. It’s taking a wholistic curatorial view of the place; engaging with it through the senses, employing intuition, honing one’s vision, seeing beyond the data to find the story the place itself wants to tell. By encouraging their stories to emerge - often by employing art thinking and process – skilful practitioners help places generate meaning for the people who inhabit them, fostering conditions for local economy, and contributing to the shared sense of cultural belonging our human spirits crave.